Manteo’s vibrant downtown scene is on full display during this monthly event that highlights the area’s businesses, restaurants and galleries that makes this central Outer Banks community so unique. The First Friday in Manteo is held every month on the initial Friday of the month, and is a street festival that will make any new visitor fall in love with this charming coastal community. Children & Youth Partnership for Dare County will hold its 12th Annual KidsFest on Friday, May 3, 2019 from 9:30am-12:30pm at Roanoke Island Festival Park in Manteo. This annual event is a FREE and fun-filled day where children, ages five and under, can enjoy face painting, bubbles, ice cream and snowballs, arts and crafts, music, large vehicles, and much more! Automobile enthusiasts can meet and greet with fellow aficionados while exploring some of the most stunning coastlines that North Carolina has to offer at this two-day festival that features a wide array of ways to have fun. The OBX Rod And Custom Festival is a special celebration of vintage and antique cars that will boast a host of family-friendly activities, from local food, to cruise-ins, to displays that will impress car fans of all tastes and ages. 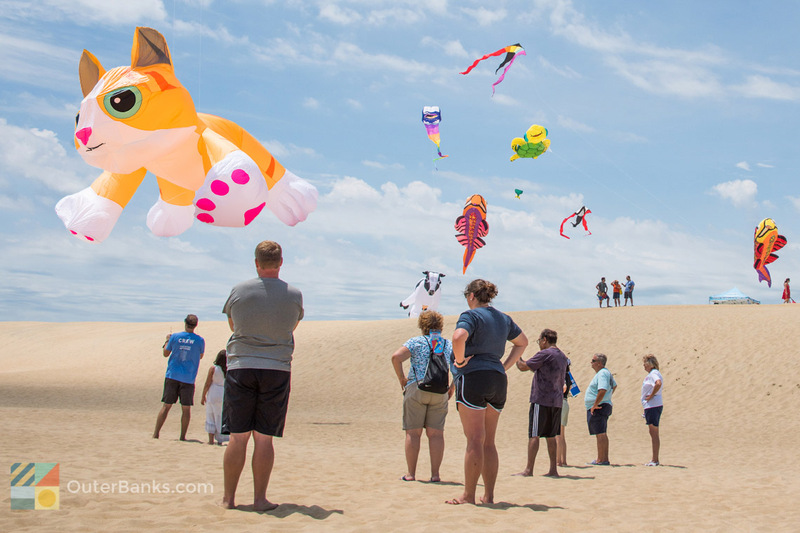 Back by popular demand, WOOFstock 2019 is a great opportunity to explore one of the Outer Banks’ most stunning venues with your favorite furry family members. This full-day event that is held at the Soundside Event Site in Nags Head has a world of dog-friendly activities and exhibits that are sure to make canines and their human companions smile from ear to ear. Come discover how you can live large without much extra space at this new-in-2019 festival that is sure to impress and surprise visitors and residents alike. The Outer Banks Tiny Home Festival serves as a fantastic opportunity to discover everything there is to know about these miniature residences, with two days of vendors, talks and presentations, live entertainment, and much more. Celebrate the birth of America with live music, a wealth of summertime foods and games, and an incredible fireworks display over the Currituck Sound at the 26th Annual Festival of Fireworks. The two day festival is open to artists from throughout the country. The juried show will exhibit original works from 75 artists from throughout the east coast. Over a dozen artists are new to the show this year and are extremely excited to be a part of such a unique and established Festival. Exhibitors include watercolors, oil & acrylic, graphics, drawings, photography, jewelry, sculpture, and pottery. The Festival provides artists and opportunity to display and sell their creative work and compete for awards. Discover how beautiful the local beaches of Hatteras Island can be in the fall, while meeting and greeting with tons of other Teardrop owners who love life on the road as much as you do, by attending this special annual rally that’s held over the picturesque Columbus Day Weekend. The Outer Banks Seafood Festival is rapidly becoming one of the highlights of the fall season, with plenty of fresh seafood, storytelling, and activities to keep everyone fully entertained. This all-day event takes place at the waterfront Event Site in Nags Head, and is a family-friendly outing that will make anyone fall in love with this staple of the Outer Banks’ culinary cuisine. Get your Outer Banks holiday off to a glittering start with this annual parade that is sure to delight visitors and locals alike. The Manteo Christmas Parade is a time-honored tradition that attracts both participants and spectators from all across the Outer Banks, and which is sure to entice anyone to get into the holiday spirit. Join in the fun of one of the most festive celebrations on Hatteras Island with this annual Christmas parade that has become a decades-long tradition for locals and holiday visitors alike. The Hatteras Island Christmas Parade combines local businesses, fire departments, the US Coast Guard, and non-profit organizations in a joyful and small-town parade that will inspire anyone to get into the holiday spirit.